The Holy Eucharist is both a sacrament and a sacrifice. Under the appearances of bread and wine, the Lord Jesus Christ is contained, offered and received. We, as Catholics, believe that the whole Christ is "really, truly and substantially" present in the Holy Eucharist. 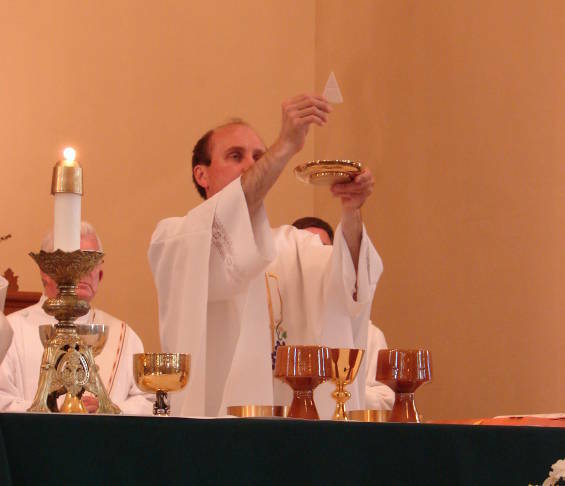 Christ gives us His own body and blood in the Holy Eucharist: first, to be offered as a sacrifice commemorating and renewing for all time the sacrifice of the cross; second, to be received by the faithful in Holy Communion; third, to remain ever on our altars as the proof of His love for us, and to be worshiped by us. The word Eucharist means "Thanksgiving". The sacrament was instituted by Jesus Christ at the Last Supper. Christ instituted the Holy Eucharist in this way: He took bread, blessed and broke it, and giving it to His apostles, said: "Take and eat; this is My body;" then He took a cup of wine, blessed it, and giving it to them, said: "All of you drink of this; for this is My blood of the new covenant which is being shed for many unto the forgiveness of sins;" finally, He gave His apostles the commission: "Do this in remembrance of Me." In the sacrament of the Eucharist, the whole spiritual good of the Church is contained, namely Jesus Christ himself. The Eucharist is a Sacrament of Initiation. All of the other sacraments are bound up with the Eucharist and oriented towards it.